Start your Penguin Island tour with a 90-minute dolphin and sea lion cruise of Shoalwater Bay near Perth. An expert guide points out bottlenose dolphins, seabirds and other wildlife in the Shoalwater Island Marine Park before you disembark at Penguin Island for a ranger-led feeding of little penguins. You have two hours of free time to explore the Discovery Centre and island on your own, but you can stay longer to swim, hike or enjoy a picnic at the shore — simply catch a later ferry back to Shoalwater. Meet your guide in Shoalwater, a Perth suburb located an approx. 45-minute drive from the central city, and begin your 90-minute dolphin and sea lion cruise to Penguin Island in the morning. 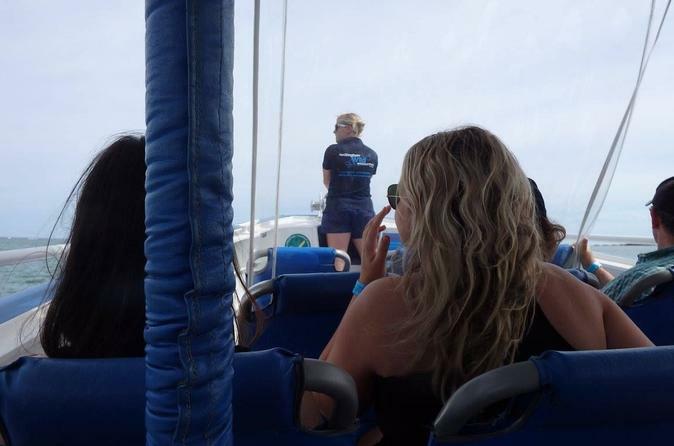 As your wildlife-viewing vessel glides through Shoalwater Island Marine Park, listen for the telltale clicks and whistles of bottlenose dolphins via the boat's underwater microphone. Your informative guide will point out some of the 200 acrobatic dolphins, including calves, known to inhabit Shoalwater Bay. Hear fascinating facts about these marine mammals as they leap next to the boat and playfully ride the wake. 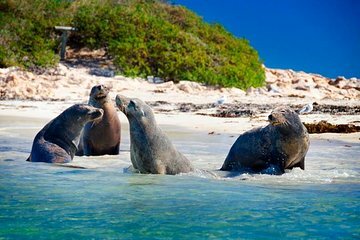 You'll get a close-up look at the Australian sea lions of Seal Island and observe seabirds such as cormorants, ospreys, pelicans and terns that nest here. When you reach the nature reserve of Penguin Island, named for the largest colony of little penguins in Western Australia, disembark at the Discovery Centre to watch a ranger-led demo and feeding of the world's smallest penguins. Enjoy the antics of the tiny blue birds swimming and waddling in a habitat that resembles their natural home. After the 20-minute presentation, enjoy free time at the center, which provides care for injured wild penguins or those deemed unfit for release. The rest of the afternoon is yours to explore the nature reserve; perhaps take an easy 45-minute hike along the nature trail, swim, picnic or simply relax. When you're ready, make your way to the jetty to catch an afternoon ferry for the 5-minute ride back to the mainland. Please dress comfortably. We recommend flip-flops or sandals and if the weather is good bring your swimwear, towels and a change of clothes. There are toilet facilities and change rooms on Penguin Island.